At the outset, I would like to thank all member states for their unanimous support for the resolution entitled “The Situation in Afghanistan.” We are particularly thankful to German Ambassador Harald Braun and his team for their hard work as penholder and their generous facilitation of the negotiations. 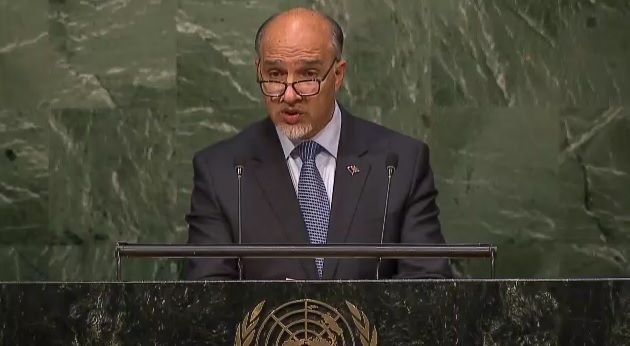 Given the current global context, with Afghanistan at the forefront of the war against terrorism, unanimous global consensus and support are crucial for the triumph of universal values of tolerance and co-existence over terror and violent extremism. We hope this important resolution will guide member states in addressing the difficult challenges facing Afghanistan. 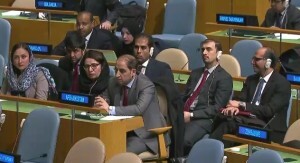 Afghan Delegates to the United Nations in New York. Before I elaborate on the situation in Afghanistan today, I would invite each one of you to think back to Afghanistan in 2001. Decades of foreign invasions and meddling resulting in political instability had left behind a country in ruins. The long road we have travelled together since 2001, with a focus on reconstruction and transformation of the country, is incredible. Despite continued challenges, Afghanistan’s overall progress in the last fifteen years stands as a symbol of international cooperation, for which the Afghans are truly grateful. Indeed, we all should be proud of the gains we have made – gains which are unprecedented in the history of Afghanistan and which would not be possible without your continuous support and sacrifice. At this moment, it is essential that we work together and focus on the consolidation and sustainability of these gains. Today, I stand before you as a new representative of a transformed Afghanistan with a strong popular mandate and high expectations from this world body, the United Nations. This post-transition year of 2015 has been eventful in every respect for Afghanistan, with enormous challenges, few opportunities, and glimpses of hope for a better future. Security, political stability, and the peace process in Afghanistan are interlinked and have a huge impact on the national, regional, and global stability, as well as the geopolitical architecture at large. This year has been the bloodiest in Afghanistan since 2001, with a sharp increase in civilian and military casualties. We have come under high levels of attacks from foreign-based Taliban including the Haqqani network, Al Qaida, ISIS (Daeish), Hekmatyar’s faction, and other extremist groups. The peak of this was the Taliban’s temporary capture of Kunduz city in late September, during which together with hundreds of international terrorists they unleashed their reign of terror on the population. The foreign orchestrators of this years’ ferocious attacks had taken advantage of three factors: (1) the withdrawal of international forces, and the strong belief of the terrorists that their attacks would make the political system collapse, (2) the lack of coordination of Pakistan’s untimely counter-terrorism operations with Afghanistan, allowing part of international terrorists to enter our soil; (3) Afghanistan’s preoccupation with its 2014 political transition, involving two rounds of elections, which slowed down governance. Alongside these threats, in 2015 Afghanistan continued to face regular attacks across the Durand Line by Pakistani security forces in clear violation of our sovereignty and territorial integrity. As a result of heavy artillery shelling in the eastern provinces many civilian and border police lives have been lost, and our citizens live in fear. Pursuant to Article 33 of the UN Charter, we have discussed these issues with the Government of Pakistan yet no action has been taken to rectify the situation. This year, the Afghan National Defense and Security Forces (ANDSF) have faced these challenges on their own, with international partners playing only a supporting role. However, given the magnitude of challenges, our forces are overstretched with law enforcement police heavily engaged in the war on terror. We have had good success when provided with air cover but the lack of effective air force and other enablers have led to high casualties. Thanks to the arrival of cold weather, the fighting season has now temporarily ceased. ANDSF has managed to keep Afghanistan mostly intact and has repelled almost all attacks with courage, competence, and resilience. During the Kunduz incident, our national resolve was tested and this only strengthened the bond between civilians and our brave defense forces. The terrorist groups might have made some gains in the short term, but they have no chance of holding ground and sustaining such gains. Naturally, ANDSF need sustainability and the right enablers to confront the enemy. In this respect, we welcome the October US announcement to support the ANDSF and counter-terrorism operations beyond 2016, and hope it will be complimented by other NATO members during the forthcoming NATO Foreign Ministers meeting in Brussels. This will further prevent safe havens for terrorist groups and enhance the enduring security partnership with Afghanistan. It is important to note that without foreign planning, logistic support, safe havens, abundance of deadly weapons and suicide bombers, the Afghan elements of the Taliban would be just another political group whose grievances could be easily addressed by the Constitution and through legitimate political processes. External support to the Taliban and other terrorist groups is primarily motivated by regional rivalry, with excessive and unnecessary anxiety and suspicion of one state over its rival’s otherwise ordinary relations with Afghanistan. This has resulted in an unsavory policy of using violent proxies in pursuit of political objectives, which has created a significant trust deficit between Pakistan and Afghanistan and provides oxygen for terror to breath. The peace process can only bear fruit if there is a paradigm shift and these issues are addressed. We appeal to Pakistan to increase direct bilateral contacts with Afghanistan away from lens of tension with other states. It is time to establish a special platform upon which genuine representatives of the two countries can address the trust deficit and move towards a friendly and sustainable neighborly cooperation. It is only then that progress can be seen in the peace process. Afghanistan has taken a number of initiatives to build trust with Pakistan. A year back, President Ghani traveled to Pakistan during one of his first overseas visits. In an unprecedented move, we sent a small team of security officers for training to Pakistan. We were ready to negotiate the Standard Operating Procedure (SOP) for security management of the Durand Line and open our arms for coordination of military operations. We presented a white paper which reflected our views on improving relations between the two countries. In response, facilitated by China and the United States, Pakistan moved to assist in the Murray talks between representatives of the Taliban leader and the Afghan Government. However, soon it was realized that we were negotiating with the representatives of a leader who had died two years earlier in a hospital in Karachi, Pakistan. So, as you can see, there has been a lack of reciprocity to our trust building initiatives. The National Unity Government of Afghanistan is currently following a two track policy. 1) Pursue the peace process through regional and international efforts. 2) Increase Afghanistan’s security capacity, so that we can defend our people and keep the region and the world safe. Implementation of most of the contents of the September 2014 Agreement on the National Unity Government has already improved political stability in the country. As President Ghani and Chief Executive Abdullah further progress with the implementation of the agreement, we continue to see improvements in the security and development sectors. Good governance, respect for rule of law, and the promotion and protection of human rights for all are key to enhancing the internal capabilities of our nation. Integral to the cause of democratization is the restoration of credibility in the electoral process. We have established the Special Electoral Reform Commission this year and have already begun to implement its recommendations at the governmental level. Fighting corruption and reinstating the integrity of our justice system is important for the Government of Afghanistan. A reliable judiciary that responds to the needs of its people, regardless of ethnicity, language, or gender, is critical in any democracy. As such, we have initiated a systematic performance review of the judiciary across the country. This year a significant number of female judges have taken the oath of office. 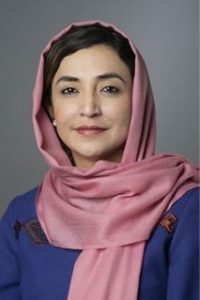 Promoting women to positions of leadership is especially important, given the grave human rights abuses that they have suffered in Afghanistan. This year, our people have experienced some of the worst brutalities, including beheading of our nationals at the hands of terrorist groups and stoning of women to death. Women require protection from the continued violence they face, and this must be facilitated by increased access to necessary resources. We are committed to the implementation of Security Council Resolution 1325 on women, peace and security. We are also focused on bringing reform to the delivery of services in preventive health, quality of education, supply of water and electricity, as well as provision of services for returnees and internally displaced persons (IDPs). Issues of social and economic development cannot be addressed without tackling our fiscal gap, 36% poverty and around 50% unemployment. Currently, they form the top priorities of our Self-reliance reform plan. Our economic situation has worsened by a shrinking economy of war, departure of foreign troops, and reduction in foreign aid. We ask member states to renew their financial support, so that we can continue to utilize funds in ways that could generate more income for our people and increase our national revenue. Procurement streamlining has brought more transparency. We have launched a comprehensive National Employment Program with a focus on generating jobs through a series of agricultural, irrigation, livestock, energy, housing, environmental, and rural development initiatives. We encourage small and medium-sized enterprises in their endeavors and continue to attract investment with the aim to trigger local productivity and ultimately transform the import-consuming economy to a local productive one. Currently, four categories of our nationals are associated with refugee crisis: (1) those who have recently arrived in Europe where they make up the second largest group, after Syrians; (2) long-time Afghan refugees in neighboring Pakistan and Iran; (3) those who are currently making arrangements to leave the country for security and/or economic reasons; and (4) Afghan diaspora settled in developed countries but living in fear of retribution for recent terrorist attacks and increasing Islamophobia. Regarding the first two categories, the obligation of host governments with respect to the protection of refugees under 1951 Convention is paramount. Concerning category three, the international community needs to invest more to bring peace, stability, and economic prosperity to Afghanistan, as this will prevent the outflow of our nationals from the country. 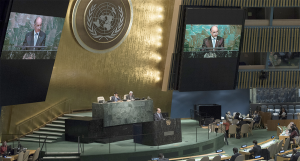 Category four needs member states’ united front in countering violent extremism and terrorism, and denying the extremists’ call for clash between Islam and the West. President Ghani is currently in Europe shoring up international coordination in war against terror, bilateral relations and proper treatment of the refugees. Considering Afghanistan’s geopolitical location in between regional and global powers, regional cooperation through continued security, political, economic and social cooperation with the neighbors and near neighboring states is of importance to us. 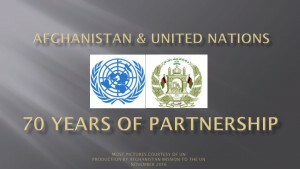 Currently, Afghanistan is leading two regional dialogue processes: the politically and security-oriented Istanbul Process (Heart of Asia), with its fifth Ministerial Conference due in Islamabad next week, and the economically-oriented Regional Economic Cooperation Conference on Afghanistan (RECCA), which had its sixth successful Ministerial Conference in Kabul last September. We are also pursuing common regional objectives through existing regional organizations and programs. The connection between criminality, terrorism, and opium production is obvious as Taliban and various international terrorist groups benefit from it. We have recently adopted the Afghanistan’s National Drug Action Plan which integrates alternative development, eradication, drug treatment and prevention programs into a broader effort aimed at furthering good governance, economic development, and security. However, I would like to remind you that the narcotics issue is a global threat, and therefore increased cooperation between Afghanistan, its neighbors, and international partners is essential for an effective drug eradication strategy. In conclusion, at a time of heightened conflict, with daily assaults and casualties, it is difficult to have patience in the slow process of transformation. But it is clear that our country has travelled a long way since its days of darkness. Just as Afghanistan has stood since 2001 as a symbol of international cooperation, a failed Afghanistan could entail far-reaching repercussions globally. With this in mind, I want to reiterate my sincere gratitude to each member state for supporting Afghanistan on its path to democracy, freedom, and development; I want to remind you all that our Decade of Transformation has just begun. Peace in Afghanistan does not begin or end in Kabul. It requires sustained commitment of regional and international partners to work collectively to achieve this objective.